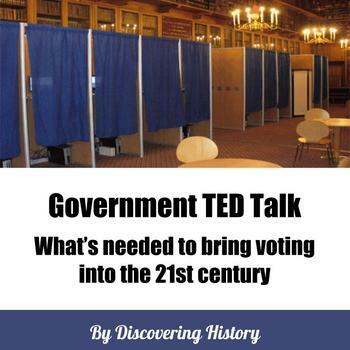 This TED Talk examines the technological deficiencies of the voting system and offers an insight into how to improve the election systems in the US. 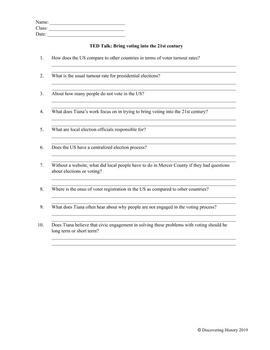 This resource would be a great fit for any classes studying elections/voting, US Government, Comparative Government, or modern democracies. 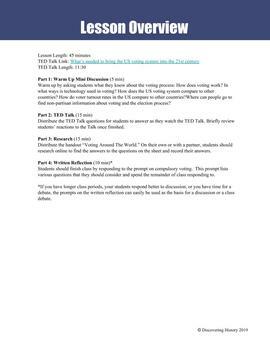 In this lesson, students watch the TED Talk, complete individual research on voter turnout rates worldwide, and respond to a prompt on compulsory voting. 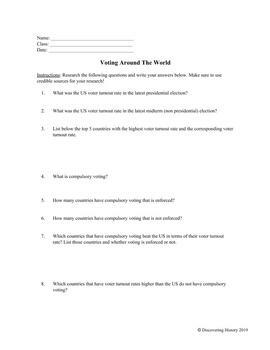 This resource is simple, straightforward, and easy to use, and I hope your students enjoy learning more about voting in the US and around the world. Please check out my Teachers Pay Teachers store, Discovering History, for more resources for teaching government, global studies, and history.